A New way to receive Trojan Thursday is here. Please help spread the word about Trojan Thursday. We went from over 500 people receiving Trojan Thursday to around 75 now with the new way of sending it out. Our athletes receive more exposure if we have more people signed up to receive this weekly update. Boys Basketball – Our boys fell to Godinez by a final of 104-87 last Friday night in the first round of the CIF playoffs. Kiron Dey led the way with 30 points and Justin Wu added 16. We want to thank everyone for their support this year and look to see everyone back in the gym to support our team next year. Congratulations to John Farah who won the CIF Individual wrestling championship last weekend at the heavyweight division. John is our first CIF individual champion since 1988. He won 5 matches overall. 4 wins were by pin in the first period. John is currently ranked #20 in the state rankings. His season will continue this weekend at the CIF Masters Meet. The best wrestlers from Southern California will compete in this 32 man field. Good luck John! Boys Tennis – Congratulations to our boys tennis team on their 12-6 victory over San Marino on Tuesday. After winning CIF and State last year word in the tennis community is that our UNI team would be a little down this year. Our boys proved that we are still the team to beat. San Marino came into the season as one of the top three teams in southern California. Riku Hashiyada brought a wave of momentum to our team as he opened the match by beating one of the nation’s top ranked singles players. Our boys are on the road this afternoon for a 3:00 match with Santa Margarita. Good Luck Tennis. 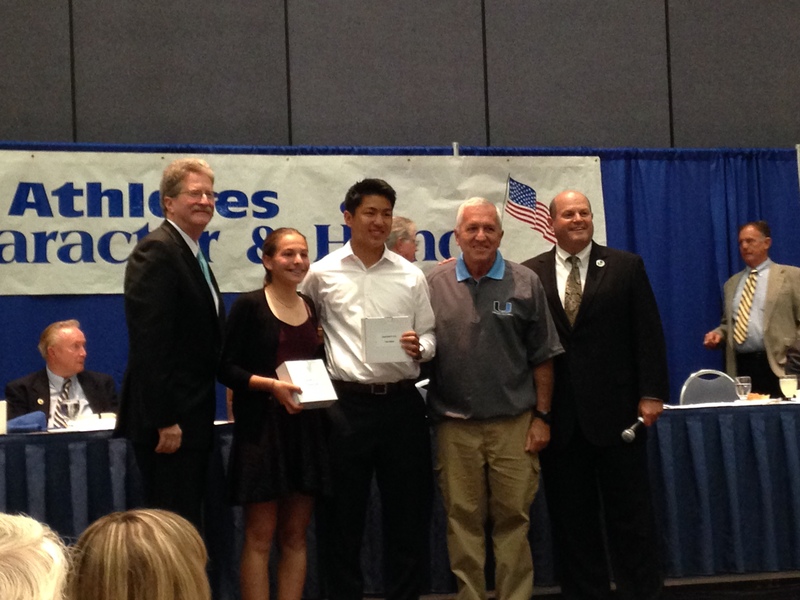 Congratulations to Tim Kwan and Sarah Stern for being selected by the athletic department as our UHS Athletes of Character. These students were presented with this honor at the Orange County Athletic Directors Association sponsored banquet on Monday night. This is an extremely prestigious award. We are always pushing for our UNI athletes to be great sports on and off the field and these two student athletes are the model of what we look for. Below is a picture of Tim and Sarah receiving their awards. Congratulations Tim and Sarah! This is one of our largest club events each year. We have over 85 school clubs who will be selling a variety of foods at lunch on Friday to raise money for their club. We will have an extended lunch for this event and it is one of the students favorite days of the year. Please send some money with your student on Friday so they can support the clubs and have a great lunch. Thanks for your support! Boys Basketball – The boys put it all together in defeating Irvine 85-68 last Thursday night. Joey Sfreddo led the way with an awesome performance scoring 37 points, dishing out seven assists and recording six steals. Kiron Dey added 19 points. Tomorrow night the Trojans travel to Godinez High in Santa Ana to take on the Grizzlies in the first round of the CIF 1A playoffs. Tickets may be purchased in the athletic office at UNI or at Godinez. Student tickets are $5.00 and adult tickets are $10.00. Game time is 7:00 p.m.
Congratulations to our Boys Frosh/Soph team for capturing the PCL Championshi this year. Girls Basketball – The Girls Basketball team finished League on a high note beating Irvine High 51-23. Allison Piper led the Trojans with 17 points and Kiara Warren added 13 points. Kiara Warren will represent our school in the 50th Annual North- South All Star Game on April 18th. The Lady Trojan JV team took home a league Championship with outstanding performances by Kaci Blailock, Kenna Uyesgi and Karissa Shin. Congratulations girls! Girls Soccer – Girls Soccer ended their season with a loss to Irvine High School, 2-0. Speaking to the competitiveness and closeness of the league, Uni finished just 4 points away from a secure CIF berth, and 3 points away from a potential “At Large” entry. With only six seniors graduating this year, the Trojans look to be very competitive when the 2015-16 seasons gets underway. Thank you to the parents, fans, and players for a fantastic season! Girls Water Polo – Congratulations to our girls water polo team for capturing third place in league. Our girls went into last Thursdays game with Irvine needing to win by at least 2 goals to secure third place. Our girls exploded for an 11-5 win. Win the win our girls were sent to the CIF playoffs for the first time since 2005. Our girls drew the #2 seeded Foothill Knights in the playoffs. Our girls were not able to stay with Foothill and dropped the match yesterday afternoon. This experience in CIF will help to strengthen our girls water polo program. The picture below is of our girls celebrating their big win v Irvine. The link below is a write up in the register about our girls making it to CIF. Great season girls. Wrestling – Our boys are preparing for the CIF individual tournament that will be held this weekend. Keep working hard boys and good luck in this prestigious tournament. A very special THANK YOU to the Curtis Family for their financial donation to our athletic training office to help Brittany order the supplies she needs to keep our athletes safe. Boys Basketball – Our boys battled league champion CDM last Thursday in front of an electric Pink Out crowd. CDM jumped out to a large lead to start the game. Our boys battled back in the 3rd quarter but the comeback fell short as CDM pulled away late in the game. On Tuesday Northwood was able to beat our boys. Tonight our boys have their last game at Irvine at 7:00. Girls Basketball – Last Thursday our girls lost to CDM. We want to thank everyone who came to the game dressed in Pink. It was a great turnout. On Tuesday our girls lost a heartbreaker to Northwood. Tonight our girls will take on Irvine at Irvine. Tip is at 5:30. Boys Soccer – Our boys tied CDM last Thursday. Indy Fuller scored our goal. On Tuesday our boys fell to league leading Northwood by a final of 3-2. We used a late surge and saw several late shots including one off the post but we were unable to find the net. Sam Kelley and Riley Duncan scored our goals and were assisted by Tommy Levasseur and David Kim. Girls Soccer – Our girls beat CDM last Thursday by a final of 2-1. On Tuesday we fell to Northwood. Last night our girls tied Beckman 1-1. This afternoon our girls will wrap up their season as they travel to Irvine. Good Luck Girls Soccer! Girls Water Polo – Our girls beat Northwood on Tuesday to set up a big game this afternoon that will determine third place. Our girls will need to beat Irvine by more than one goal to qualify for third place and make the playoffs. GOOD LUCK TODAY POLO! Wrestling – Our boys are preparing for the CIF individual tournament that will be held next weekend. Keep working hard boys and good luck in this prestigious tournament. UNI-lympics – Our class councils are competing in a week long Olympic style competition. We had several hundred students come out on Tuesday night as the events were held in the stadium. The rest of the week’s activities are all being held at lunch. Spring Sports Parent Meeting – If your son or daughter is playing a spring sport there will be a spring sport parent meeting in the MPR on Tuesday February 17th at 6:00. The athletic directors will go over some valuable information and then each sport will break off and have individual team parent meetings. A New way to receive Trojan Thursday is here. If you would like to receive Trojan Thursday each week please go to https://unitrojanthursday.wordpress.com and type in your email address. You will receive a notice each week when Trojan Thursday is posted. Please spread the word about this new way to receive Trojan Thursday to anyone interested in UNI Athletics. Boys Basketball – Last Thursday, Woodbridge pulled away in the last five minutes to defeat the Trojans 61-50. Joey Sfreddo scored 17 to lead the Trojans. On Tuesday, UNI did better offensively but fell to Beckman 102-93. Kiron Dey scored 27 to pace the Trojans. Tomorrow night the Trojans host league leading Corona del Mar on Senior night. Please wear your pink and come out to support our boys. Girls Basketball – Last Thursday our girls fell to Woodbridge by a final of 67-42. On Tuesday Beckman defeated us by a final of 58-39. Tomorrow night is a pink out. We are asking all fans to wear pink to our game against CDM that starts at 5:30. Pink Trojan Army shirts are available in the athletic office for $10. Last Thursday our boys fell to Woodbridge by a final of 2-0. Yesterday our boys played to a 2-2 tie with Beckman. Goals from Indy Fuller and Marcos Fernandez. Assists by Indy Fuller and Justin Lin. Our boys will travel to CDM this afternoon for an important game in the league race. Girls Soccer – Our girls fell to Woodbridge last Thursday night by a final of 1-0. This afternoon our girls are back at home for a 3:15 game against CDM. A win puts our girls right in the thick of the playoff hunt. Good luck Girls. 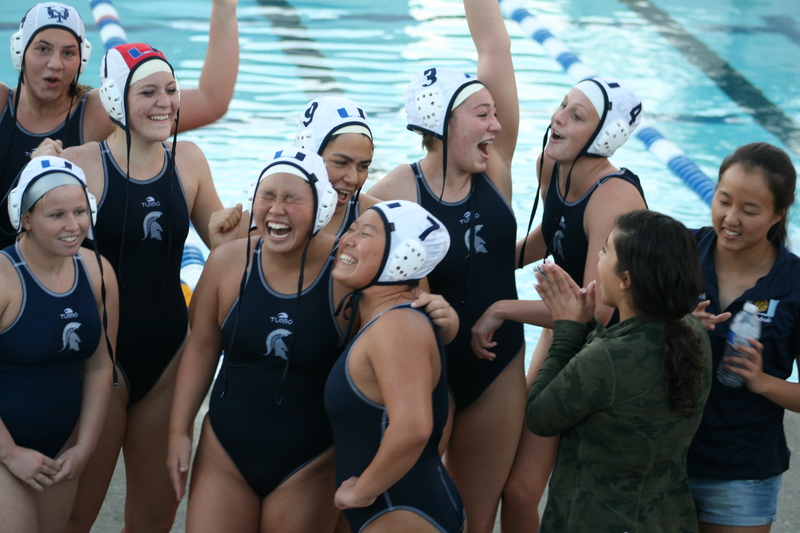 Girls Water Polo – Our girls exploded for an 11-4 victory over Woodbridge last Thursday. On Tuesday Beckman beat us by a final of 11-6. Our girls have a nice little break before heading back to game action next Tuesday against Northwood. Wrestling – Congratulations to Alex Pourdanesh and John Farrah for winning an individual league championship. As a team our boys secured a second place finish in league. Our boys will have a few weeks off to prepare for the team and individual CIF tournaments. 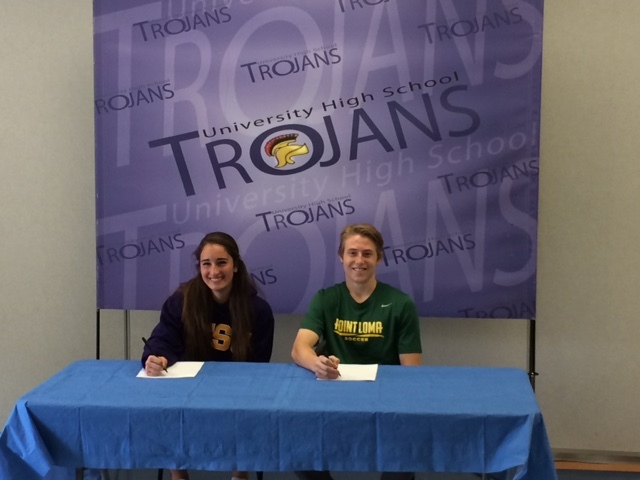 Congratulations to Indiana Fuller and Hanna Ghamari as they signed their National Letters of Intent yesterday. Indi signed to play at Point Loma and Hanna will be playing at San Francisco St. Congratulations to these two athletes on receiving an athletic scholarship. PINK OUT – Tomorrow the Pink Ribbon Club and the Trojan Army are hosting a Pink Out for our girls and boys basketball games. Wear your Pink shirt to the games and come cheer on our Trojans. Pink Trojan Army shirts will be on sale at lunch in the crossroads and the Athletic office today and Friday until we are sold out. Shirts cost $10. We sold out of 300 shirts in a matter of minutes during football season. We have ordered another 150 shirts. If you didn’t get a shirt during football season make sure you get yours to show your PINK TROJAN SPIRIT! February 11, 2015 – 3:00-5:00pm and February 12th 3:00-5:00. Meet at stadium – You MUST have an athletic ID card to try out. Please bring running shoes and cleats. Contact coach Andreas Gaynor if you have any questions. Go to Unilacrosse.com for program details. Michael Stern was our UNI athletic announcer all 4 year he attended UNI. He worked with the football, girls and boys basketball, baseball, and softball teams while he was here at UNI. Michael is now a sophomore at Northwestern studying journalism and he is continuing his sports writing, announcing, and broadcasting there. Michael does a weekly athletic rundown on the Northwestern University’s TV station called “A Stern Talk”. Click the link below and find his piece at the 23:30 point. Great job Michael! Everyone here in the UNI athletic department is extremely proud of you.